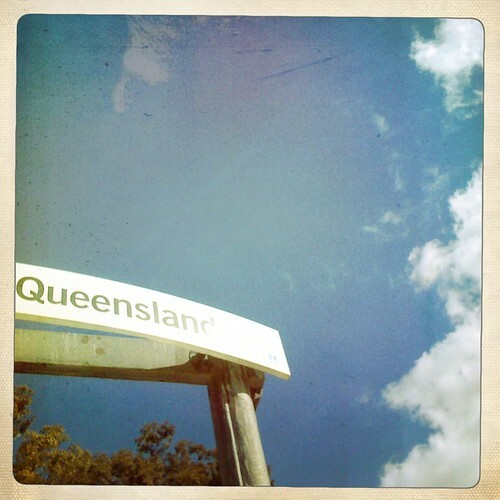 Queensland, originally uploaded by Mister Wind-Up Bird. Well, it’s been a busy couple of weeks here in Aus. Upon our arrival, we got the paperwork and Janelle’s passport together and sent it all to Sydney for her Permanent Resident visa. The process takes a while, so we spent the time sorting through and packing Janelle’s stuff, visiting with friends and family and exploring Queensland a bit. We took the train to Brisbane and then went 1200km up the coast to the Whitsundays region to see the crocodiles and white sand beaches and snorkel on the edge of the Great Barrier Reef. Of course, it’s the middle of winter here, so it’s been a lot more wind, rain, jeans and hoodies than swimwear and sunburns. The snorkeling was downright hypothermic, to be honest. Anyway, it’s been an exciting, busy and sometimes very trying time. While we’re thrilled to begin our life together in Van, if I were more into purple prose I’d say these days are also tinged with melancholy. Preparing to pack up and leave your old life behind is no easy thing, even in the age of Skype and relatively affordable trans-Pacific flights. And once we get to Van, we will need to find a new place to live and set up a home together, which will be an adventure in itself, though probably a less blogworthy one. But yeah! We’re going home. I’m already secretly planning our next trip to Asia.